Awww... Blushing Anushka Admits To Missing Virat While Promoting Sui Dhaga! Absence, that common cure of love, we say. For we may not know if it is a cure or not, Virat Kohli's absence is sure making Anushka Sharma miss the country's heartthrob. The actress, while in Jaipur for promotions of her upcoming flick Sui Dhaga, faced a mob that couldn't stop chanting her husband's name. Giving in, she too admitted that she was missing him. 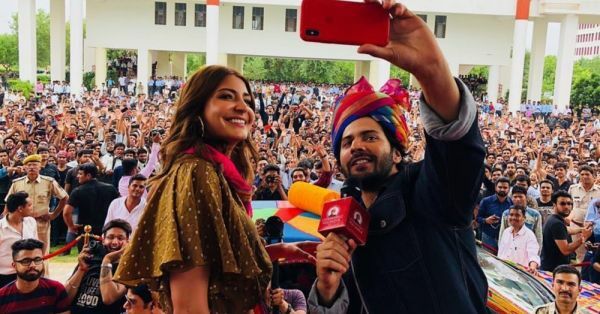 The actress was on a promotional tour to Vivekananda Global University, Jaipur, with her co-star Varun Dhawan, on August 27. The mention of Virat Kohli follows Anushka Sharma like a shadow and at the university too, students started chanting her husband's name. This left the actress rosy-cheeked, while Varun too had his share of fun as he commented, “Unse mujhe bhi bahut prem hai" (I also love him a lot). To calm the mob, Anushka said, "Ji ji, haan haan haan! Sabko unse prem hai, mujhe bhi hai. Sabko unki yaad aarai hai, mujhe bhi aarai hai." (Yes yes! Everyone loves him, so do I. Everyone is missing him, so am I), while she had a big smile on her face. 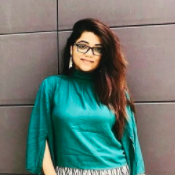 Getting back to what they were at the university for, she said, "But right now, let’s focus on the film’s trailer aur phir hum aapko dikhane wale hain Chaav Laga, humara pehla gana" (Then we will show you Chaav Laga, the film's first song). Meanwhile, Virat is in England for a test match series. India has been handed its third consecutive series defeat, with the host leading by 3-1 in the five-match series. However, luck never seems to go dull on Virat as he has recently become the first Indian batsman to score over 4000 runs as a Test Captain.